Join us for an introduction by co-writer/director Matthew Sleeth and a special screening of Guilty on World Day Against the Death Penalty. The film depicts the final days in the life of Myuran Sukumaran, the convicted criminal who became an accomplished artist on death row under the tutorship of artist Ben Quilty. 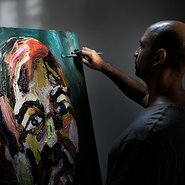 In the film, clinical preparations for capital punishment contrast with Myuran’s indomitable spirit as he creates some of his most powerful paintings just before his execution by an Indonesian firing squad alongside fellow Australian Andrew Chan in April 2015. Myuran Sukumaran and Andrew Chan were fully rehabilitated men at the time of their executions. Guilty shows the tragic loss of their lives and the horrific impact the executions had on their families. This film – and these screening events – are to support organisations working towards worldwide abolition of the death penalty at a time when the Australian government is negotiating a resolution on a moratorium on the death penalty in the United Nations.